One might legitimately wonder why Manufacture d’Armes de Bayonne (MAB) would decide to make the 6.35mm Model B pistol when they already had a successful 6.35mm product in the Model A. My answer would be, for the same reason that Fabrique Nationale (FN) decided to make the 6.35mm Baby Browning when they already had the the very successful 6.35mm Model 1906--to compete with the Walther Model 9. The Walther appeared a few years after the first World War in 1921 and was an instant success. It was the smallest, lightest 6.35mm pistol on the market, its quality of manufacture was very high, and it was astonishingly accurate for such a tiny gun. In this era, small-caliber pistols were still legal in much of Europe, many people wanted to carry them for self-protection, and many companies sought to profit by making them. Other similarly small pistols began to appear within a few years of the Walther. Possibly the first was the Menz Liliput of 1924, followed by the Haenel Schmeisser Model II of 1927. 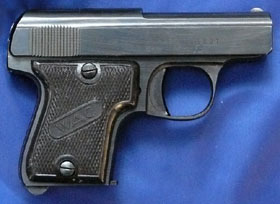 The Baby Browning may have been developed as early as 1927, but did not appear on the market until 1931. 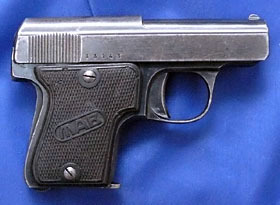 The MAB Model B appeared late in 1932, and the French-made Mikros pistol appeared in 1934. 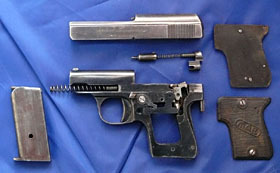 The MAB Model B is a fairly close copy of the Walther Model 9, being an unlocked breech, striker-fired self-loading pistol with a fixed barrel, recoil spring beneath the barrel, open-top slide, top-mounted internal extractor, and a mechanism at the rear of the frame to allow removal of the slide. On the Walther the backstop to the striker spring is part of a spring-loaded barbell- shaped piece with a tiny latch inset at the bottom--when the latch is lifted upward the backstop springs out from the back of the frame about 7-8 millimeters, allowing the slide to be lifted up for removal. The MAB has a similar barbell-shaped part, the upper portion of which serves as a backstop to the striker spring, but it is not fixed in the frame, and there is no latch-- instead, a small rectangular piece of metal is dovetailed into the back of the frame to form a backplate that slides down to allow removal of the backstop. This mechanism was actually patented by Léon Barthe, the founder of MAB--application was made on 23 November 1932 and French patent number 746237 was issued on 7 March 1933. The Walther provides a cocking indicator, whereas the MAB does not. The MAB provides a magazine safety and a grip safety (Type I), which are lacking in the Walther. 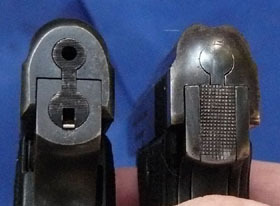 The Walther’s connector is external on the right side of the gun, whereas the MAB’s connector is internal and runs on the left side of the gun. The first MAB Model B was assembled on 8 August 1932--it had a nickel finish and its serial number was 79084. Obviously, MAB did not start a new numbering series for the new gun, so I assume that the Model B was numbered in the same series as the Model A. The first blued Model B was assembled on 29 August 1932 (serial number 79144). The Model B designer simply miniaturized the lockwork used in the Type II Model A, Second Variant, for use in the Model B. The disconnector projects upward from the connector bar and has a round lobe on top. The manual safety pivots on a screw for a distance of 10mm to lock the connector bar. When engaged, the safety lever rotates into a cut in the slide, locking it closed. The grip safety, like that of the Model A, is based on the Browning- designed grip safety that appeared on the 1906 FN Browning Vest Pocket pistol. The upper projection of the grip lever blocks the sear, preventing it from moving downward except when the grip lever is depressed. The slightly longer length of the Model B over the Walther Model 9 is almost certainly due to its grip safety. The magazine safety, like that of the Model A, is probably based on the Tansley safety in the 1908 Colt. 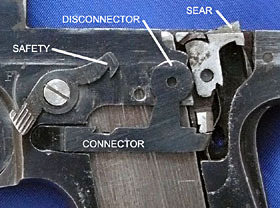 Inserting the magazine provides a fulcrum point for the magazine disconnector that allows the motion of the trigger and connector bar to rotate the sear downward. 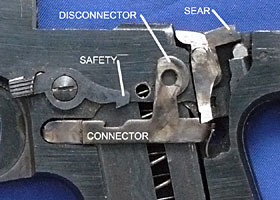 If the magazine is removed, the magazine disconnector has nothing against which to pivot, and so no movement is transmitted to the sear to release the striker. The recoil spring is contained between the barrel and the bottom of the frame, and on each side by the slide. The recoil spring guide is a mere centimeter in length, serving to prevent deformation of the rear end of the spring. The guide is inset into a hole drilled in the frame beneath the barrel. 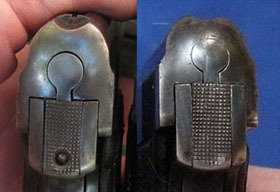 The front of the recoil spring narrows to a smaller opening, which fits over a metal stud on the inside of the crosspiece at the front of the slide (like the late Walther Model 9). The slide legend, on the left side, does not distinguish the gun in any way from the Model A. It is on two lines, in all capital serif characters, except for the “MAB,” which is in stylized sans-serif characters. On Type I that I examined the slide legend was not perfectly aligned. The serial number is on the right side of the slide. The early Model B is one of the few guns I have encountered with no serial number on the frame. Assembly numbers are stamped on some components, but they bear no relationship to the serial number. I have been unable to locate an assembly number on the frame, but I haven’t disassembled the gun to its last pin. The slide has 17 triangular-cut serrations, which are scalloped toward the middle to allow for a firm grip with the thumb and forefinger. The takedown door on the back is checkered. Sights are integral--a half-moon shaped piece at the front and a V cutout at the rear. The magazine is unmarked. It has five holes drilled on the right side for viewing cartridges, and a single hole on the left. The baseplate is pinned to the body. The grips are made of checkered horn, with the MAB monogram in an angled oval cartouche in the middle of the grip. We have noted two different backplates at the rear of the Type I, one with a hole near the bottom, and another without the hole. The gun was initially available with a blued finish, but according to Bastié and Casanova a deluxe model in nickel plate with pearl grips was available soon after production began, though I have never seen one. 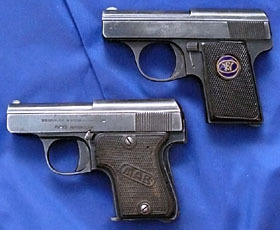 The entire line of MAB pistols was redesigned, probably soon after the Second World War, including the Model B. The most significant internal changes were the elimination of the grip safety and the redesign of the sear. The new sear is tensioned by a coil spring and plunger instead of a leaf spring. The size and shape of the magazine release was altered slightly. The new manual safety lever only moves about 2 or 3 millimeters, whereas the old lever moves 10 millimeters. The new safety no longer locks the slide, and consequently there is no cut in the lower edge of the slide. The new recoil spring is no longer tapered at one end, and the metal stud on the crosspiece at the front of the slide has been eliminated. 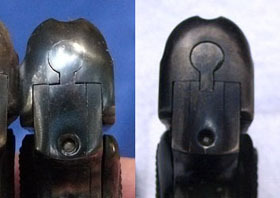 The door at the rear of the frame is no longer checkered, but instead has a hole into which a takedown tool is inserted in order to disassemble the pistol. The slide legend remains on the left side. Some guns have it on a single line in all capital sans-serif characters (observed on s/n 25297). Some guns have a two line inscription that includes the model designation (observed on s/n 25724). The serial number sequence appears to have been restarted, in the 2xxxx range, but I have not seen sufficient examples to know exactly where, though the examples I’ve seen were in the 25xxx range. * The serial number is stamped on the right side of the slide. On s/n 25297 the frame is stamped (beneath the slide) with the last two digits of the serial number, as are other components. On s/n 25724 the full serial number is stamped on the frame beneath the slide, while some components also have the last two digits of the serial number stamped on them. 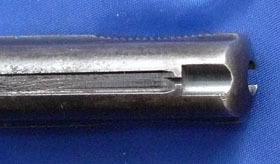 The magazine of the second variant Model B remains unmarked, but has a slot on the left side for viewing cartridges. There are no holes on the right side, and the baseplate is no longer pinned to the body. 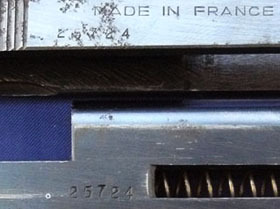 Imported guns are typically marked MADE IN FRANCE on the right side of the slide in all capital sans-serif characters. After the war, in the United States, MAB pistols were imported by the Western Arms Corporation of Los Angeles. 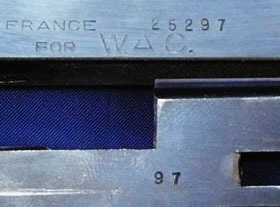 Many of the guns imported by WAC were stamped FOR W.A.C. beneath or next to MADE IN FRANCE on the right side of the slide. In most cases it is obvious that the FOR W.A.C. was stamped at a later time than the MADE IN FRANCE. Guns imported by Western Arms will usually (but not always) have WAC on the grips instead of MAB. We have noted two different backplates on the Type II, one that is rectangular and one with a cut-out at the top. According to Huon, manufacture of the Model B ceased in 1949, however Josserand gives the date as 1964. The Model B was still being offered for sale in the U.S. by Western Arms as late as 1953, and there is firm evidence that the pistol was still being exported to Germany as late as 1957. Total production of the Model B is unknown. To estimate it we need to collect serial numbers for both Type I and Type II pistols and try to determine the earliest and latest numbers. Please contact me if you can help. * Thus far, we know that Type I serial numbers extend from 79084 to 86207, and Type II serial numbers extend from 25297 to 28852, but our sample is far too small. Slide the door at the back of the frame down. Remove the recoil spring with its guide and backstop from the rear of the gun. * I would appreciate hearing from owners of Model B pistols who are willing to share their serial numbers. Photographs of your Model B would also be welcome. Information regarding provenance and/or date of purchase would be especially valuable. Write to Ed Buffaloe. “The M.A.B. Pistols,” by Michel H. Josserand. American Handgunner, May/June 1979. Special thanks to Earl Mount for allowing me to examine and photograph his Model B pistols.